"Millions of readers have fallen in love with Little Women. But how could Louisa May Alcott-who never had a romance-write so convincingly of love and heart-break without experiencing it herself? From an early age I was a fan of Louisa May Alcott's novel "Little Women," where the four wonderfully distinct March sisters--Meg, Amy, Beth, and feisty Jo--share the joys and sorrows of growing up helping their "Marmee" while their father is away at the Civil War. When TLC Book Tours offered me a chance to be part of a book blog tour for "The Lost Summer of Louisa May Alcott," I was very excited and happy for the opportunity to review it. It is no secret that Alcott based "Little Women" on her own early life, and that she was the sister "Jo" in it. 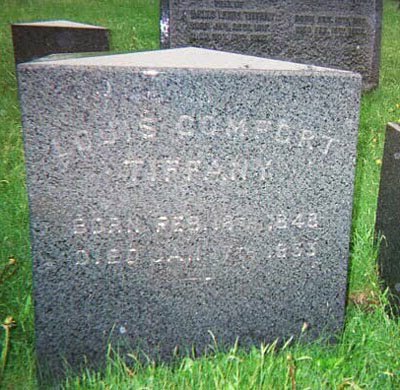 As author Kelly O'Conner McNees points out so well in her novel, Louisa's family was poor in worldly goods, primarily due to her father, the transcendentalist Bronson Alcott, whose philosophical pursuits never provided adequately for the Alcott family. His wife, Abigail May Alcott, known as Abba, is kind hearted and self sacrificing, but also overwhelmed raising four girls basically by herself, while her husband was out hobnobbing with eminent male authors of the time, such as Emerson and Thoreau. Louisa helped to support herself and her sisters with “woman’s work,” including sewing, doing laundry, and acting as a domestic servant, but she had a passionate love of writing, especially for her dashingly adventurous "blood and thunder" tales. McNees skillfully weaves her novel around the summer of 1855, when Louisa is twenty two years old and the Alcott family has just moved to a house in Walpole, New Hampshire. The house was loaned to them by an uncle, who was sympathetic of their poverty. Louisa is desperately planning ways to achieve her independence from womanly chores, so that she can devote herself to writing full time, when she meets the fictional Joseph Singer, a handsome and confident shopkeeper's son. He impresses her with his literary knowledge and with his mutual admiration for Walt Whitman. Whitman's revolutionary style of poetry, "Leaves of Grass," was released that summer, and the author imagined that Louisa would have secretly read it and have been influenced by it. McNees entwines Louisa's and Joseph's initial feelings of attraction and love with Louisa's powerfully driven desire to remain independent and vanquish her family's debt with her writings. As I read the novel I found myself wishing Louisa could have the fulfillment of marriage and a career as an author, but I knew she would have to chose one over the other, or ultimately lose both. "The Lost Summer of Louisa May Alcott" is the perfect book to read this summer as an escape back into the world of "Little Women." This time it is more of an adult version, where the realities of the Alcott family lives are more honestly portrayed, and where Louisa is even more headstrong and determined than she was as her character "Jo," but no less endearing. I highly recommend it as an easy, descriptive and totally enjoyable book to read! "Kelly O’Connor McNees is a former editorial assistant and English teacher. 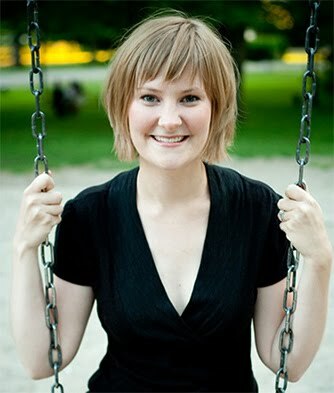 Born and raised in Michigan, she has lived in New York, Rhode Island, and Ontario and now resides with her husband in Chicago. 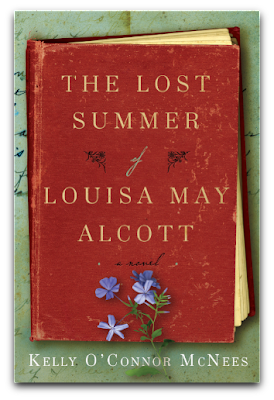 The Lost Summer of Louisa May Alcott is her first novel." Please visit Kelly's web site to read more about her book, Louisa May Alcott, and to find a list of her readings and book signings. Kelly will also be visiting my blog today, so if you have any questions about her book, or Louisa May Alcott in general, please write them in your comments and hopefully Kelly will see them today and answer them. Thanks, Kelly, for a wonderfully crafted book--I look forward to your next novel! Disclosure: I received an advance copy of this book from TLC Book Tours for my review and was not otherwise compensated for my participation in their online book tour for this novel. Brooklyn, New York's, Green-Wood Cemetery dates back to 1838 and was named a National Historic Landmark for its art, architecture, landscaping and history. Its scenic winding paths are lined with trees, hills and ponds. It was a popular tourist attraction in the 1850s and it was the place where most famous New Yorkers who died during the second half of the nineteenth century were buried. The New York Times said in 1866 that was the "ambition of the New Yorker to live upon the Fifth Avenue, to take his airings in the (Central) Park, and to sleep with his fathers in Green-Wood." This is the mausoleum of Marcus Daly, 1841 - 1900. Daly was a wealthy Montana copper mine owner. He had emigrated from Ireland at age fifteen, penniless and without much education. By age 20 he had moved West and worked in silver mines in California and Nevada, and eventually became a prospector for a mining company and found silver mines in Montana. In 1881 he found a massive copper vein in the Anaconda mine of which he had become part owner. The value of copper at the time was high, as it was needed for the recently invented electric light bulb. By finding financiers to help build a smelter in Butte, Montana, to process the copper in the mine he was part owner of, Daly soon became wealthy and was known as the "Copper King." On certain special tours and occasions the mausoleum is opened for public viewing. The interior of the mausoleum is covered with marble. Daly and his wife's remains are located in a vault in the rear and above is a magnificent Tiffany stained glass window. The colors of the glass are deep and luminous! It is hard to believe that this beautiful window is almost hidden away from view for most of the year. As the sunlight changes so does the intensity of the colors in some parts of the window. I took photographs focused on four quadrants so you can see more detail. 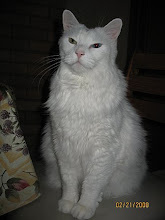 All photos in this post can be enlarged by double clicking on them -- use the back arrow to return to the post. You can see examples of the opalescent glass which is a signature aspect of Tiffany glass. The light shimmers through with a luminous glow. Louis Comfort Tiffany mastered the art of drawing in glass and incorporated elements of Arts and Crafts, Art Nouveau and the other international artistic movements of the era. His unique blend of brilliant color and his technological advances in glass brought him international recognition as a great, if not the greatest, glass maker of his time. The Daly mausoleum even has a transom of stained glass window above the doors. For all the opulence of the Tiffany stained glass window in the Daly mausoleum, Louis Comfort Tiffany (1848 -1933), is buried in Green-Wood Cemetery in a simple grave on a nearby hill, with just a small headstone. I'm joining "Outdoor Wednesday" on the A Southern Daydreamer blog Click the link to see links to all blogs participating today. At irregular intervals along the way, approximately 100 artists, poets, performers, and athletes who were born or have lived in Brooklyn are honored. Each paver also contains a bronze medallion of the Brooklyn Bridge, encircled by the phrase "The Greatness of Brooklyn Is Its People." New names are added to Celebrity Path each June during the borough's annual "Welcome Back to Brooklyn Day." 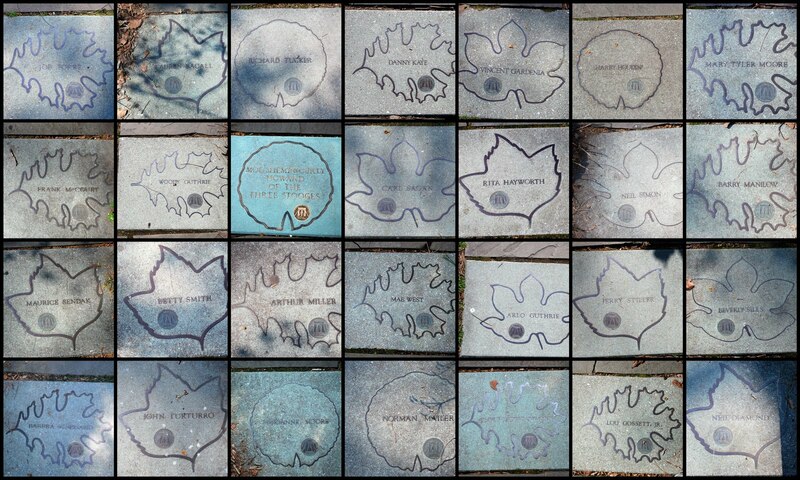 This photo mosaic shows a representative of the many stones along the path. To enlarge the photo double click it. It is Brooklyn's answer to Hollywood's "Walk of Fame"! The Brooklyn Celebrity Path meanders through Austrian pines, rhododendrons, and daffodils. It is located just south of the Japanese Hill and Pond Garden. and across from the Shakespeare Garden. It is fun to walk along it and find the familiar names. Were you surprised to see how many famous people originated from Brooklyn, New York? Who is the most famous resident, either past or present, from where you live ? I'm part of Mary's "Mosaic Monday" on her blog Little Red House today. 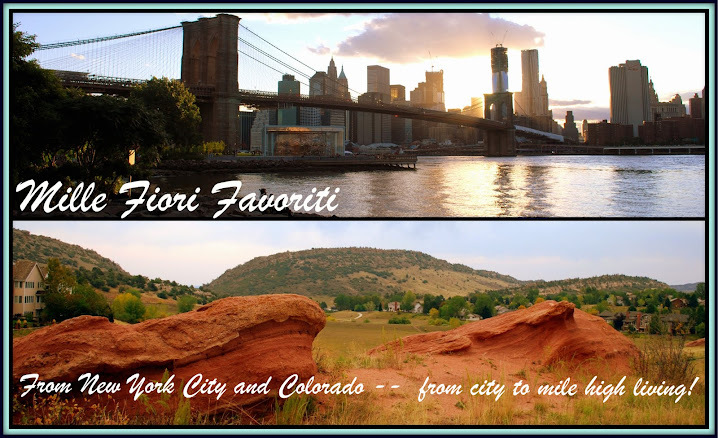 Please visit Mary to see her photo mosaic and to find links to other participating blogs. Thank you, Mary! 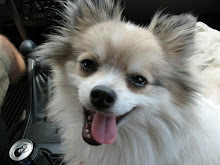 I almost lost my best friend during the Easter weekend. She had spent the week as most of us do -- cleaning, shopping, cooking and generally preparing for the holiday weekend. She was feeling fine, perhaps a little tired, perhaps a little "under the weather" as she suffers from Spring time allergies and would often get slight sinus headaches this time of the year. We did our normal 2 mile walk together around the park on a Friday morning, as we do most mornings for exercise. She was excited her daughter was coming home for a visit, and as we parted in the parking lot we happily wished each other a good holiday. It could have been the last time I saw her! Late that evening she had dozed off sitting in the couch, when all of a sudden an odd sensation woke her up. Her chest felt on fire. She described it to me as if the sun suddenly burst in her chest. Her arms went heavy. She knew something was seriously wrong but walked up the steps to the second floor of her house to wake her husband and she told him to get dressed as she needed to go to the hospital. He asked what was wrong and then asked her if she wanted to take something first and rest awhile and see if it helped. Thank God my friend knew she couldn't risk this and told him she thought she should go right away to the hospital. Luckily, they live two blocks away from a small community hospital and her husband drove her up to the emergency room where she then collapsed. In a flurry of motion she was whisked inside where they found her heart rate and blood pressure were dangerously low -- she was having a heart attack! The nurses and doctors furiously began emergency treatment. A cardiologist on call came in and told her she was going to be transferred to a hospital in Manhattan where cardiac cauterization would take place immediately on arrival. "Don't worry," he told her, "We are going to save your life! The ambulance whisked her through traffic from Brooklyn into Manhattan, where the small community hospital is affiliated, and two cardiac stents were placed into my friend's heart's almost totally occluded artery. She would live to joke with me on the phone on Easter Sunday and give praise at how life gave her a second chance. What were the warnings signs before this event? Not many. 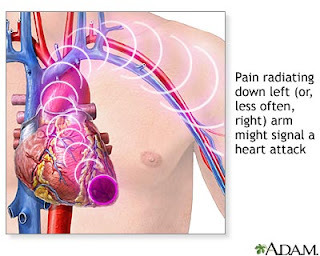 Many times the first signs of heart disease is a heart attack. My friend is fit, trim and strong. She never experienced shortness of breath or chest pain. Her cholesterol was within normal limits, maybe slightly high by today's stricter standards. 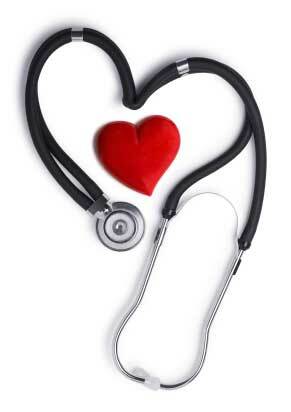 She had found out she had high blood pressure only six months prior but it was being controlled by medication. She exercises and doe not smoke or drink. But even with good lifestyle women after menopause are more susceptible to developing heart disease, and there are other risk factors such as family history, taking birth control pills, being exposed to second hand smoke, etc. With any severe episode of chest pain or discomfort it is imperative to go to an emergency room and tell them right away you are having chest pain, which my friend did, and this is what ultimately saved her life! According to The National Institute of Health , heart disease is the number one killer of women, yet women are more likely to delay in seeking emergency treatment. Other symptoms, such as a shortness of breath, breaking out in a cold sweat, nausea, or lightheadedness. If you feel heart attack symptoms, do not delay. Remember, minutes matter! Do not wait for more than a few minutes–5 minutes at most–to call 9-1-1. Your family will benefit most if you seek fast treatment." The pamphlet "The Heart Truth for Women" can be ordered from The National Heart Lung and Blood Institute that gives information on the causes of women’s heart disease and practical suggestions for reducing your own personal risk of heart-related problems. It can also be viewed and downloaded for free online in PDF form at this link. The Mayo Clinic web site also has good information about possible symptoms of heart attack in women, which can sometimes be as vague as unusual or unexplained fatigue. You can also look at risk factors and prevention tips on their web site. Let's do all we can to improve our lifestyles to prevent heart disease and to remember to call 911 and go to a hospital at the first sign of unusal discomfort. It can save your life! All week I've been showing you wonderful views of the beautiful and historic Brooklyn Botanic Garden. 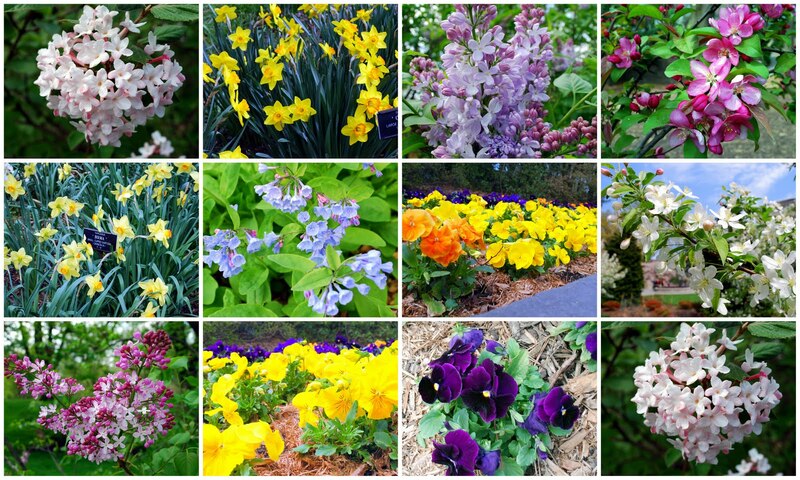 Springtime is a wonderful time to visit as the first blooms appear, from cherry trees, magnolia trees, and the assorted flowering bulbs such as daffodils and tulips. Spring comes slowly to the Northeast and we have to be patient waiting it's arrival, but when it does appear New Yorkers rejoice and come out in large numbers to enjoy the gardens. 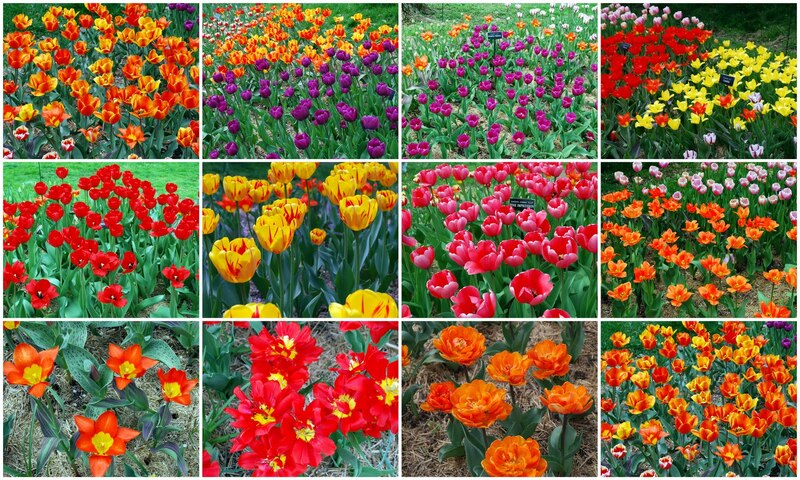 The tulips were ablaze in color! They are truly drops from God's colorful paintbrush! The magnificent old trees in the garden were beginning to awaken and stretch their limbs and shake out their leafy fingers. Flowers were everywhere, some releasing their delicate perfume scent into the air. 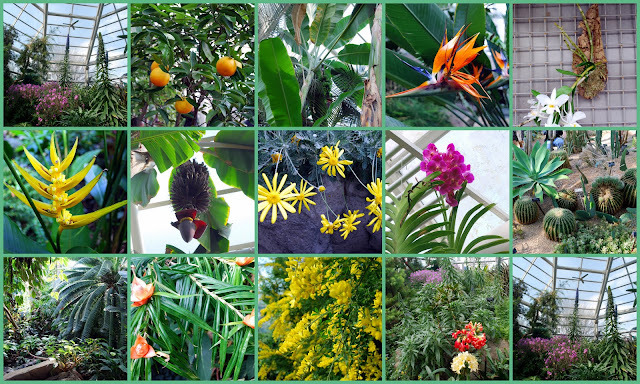 Inside the conservatory the sunshine of Spring spurred on new growth and developing fruits. The visual poetry of nature was there to be enjoyed and savored. Yet the garden still held promises of more to come, as we look down upon The Cranford Rose Garden waiting for the month of June to begin blooming. "Come back," it whipered to me. "I will," I promised. I will! 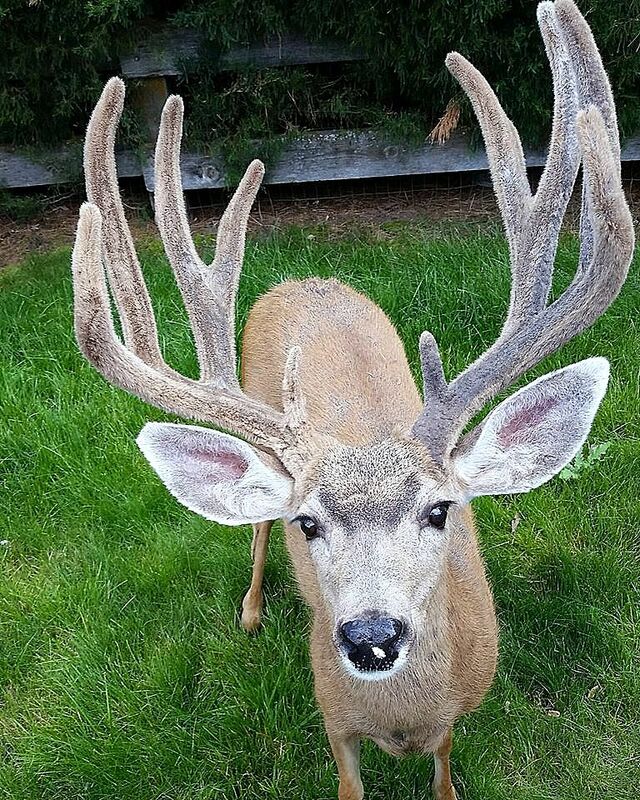 This post is one of many in Susan's A Southern Daydreamer blog's "Outdoor Wednesday" event. Please visit Susan's blog today to see links to all the blogs participating with their beautiful outdoor photos. The Steinhardt Conservatory in the Brooklyn Botanic Garden, located at 1000 Washington Avenue in Brooklyn, New York, is a complex of display and support greenhouses that holds the garden's collection of more than 8,000 indoor plants from an array of plant habitats. 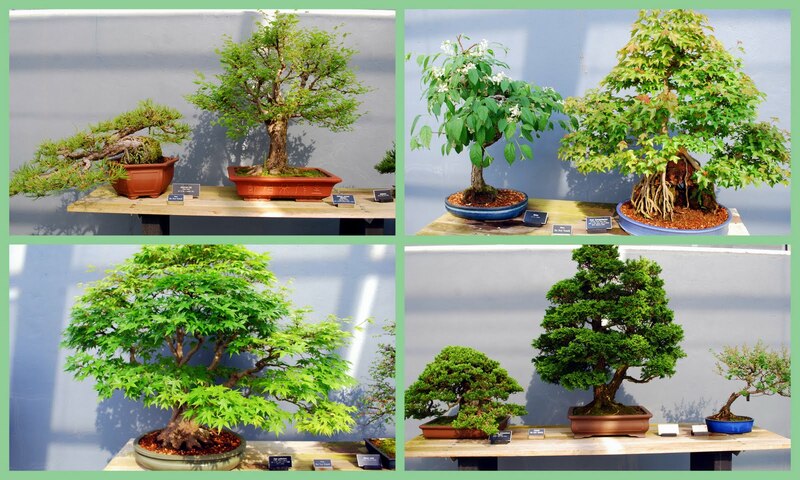 The Brooklyn Botanic Garden's extensive bonsai collection has long been considered one of the finest in the world. The collection's approximately 350 trees comprise the second oldest collection in the country and one of the largest on public display outside Japan, with as many as 30 specimens displayed in the exhibit on a rotating basis. Bonsai is the Japanese art of growing trees, or woody plants shaped as trees, in containers. 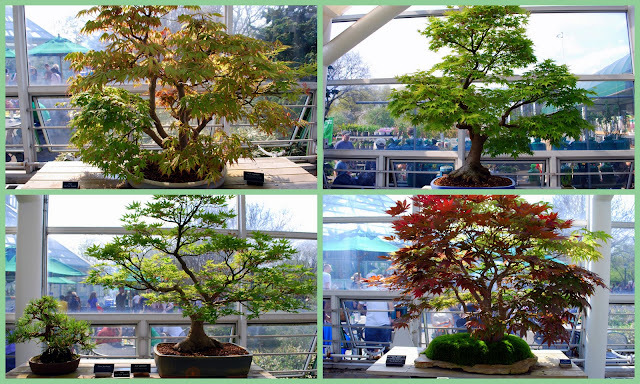 BBG’s bonsai collection began in 1925 with 32 dwarf potted trees. The bonsai are displayed in a Japanese-style architectural setting. 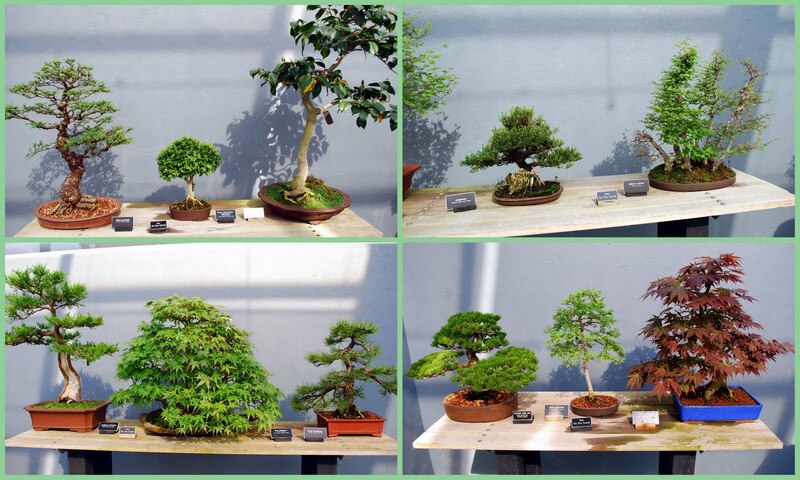 Text panels introduce the history of bonsai and explain the plants' culture and care. This Wisteria Floribunda is 75 years old and was in bloom the day I visited the garden. 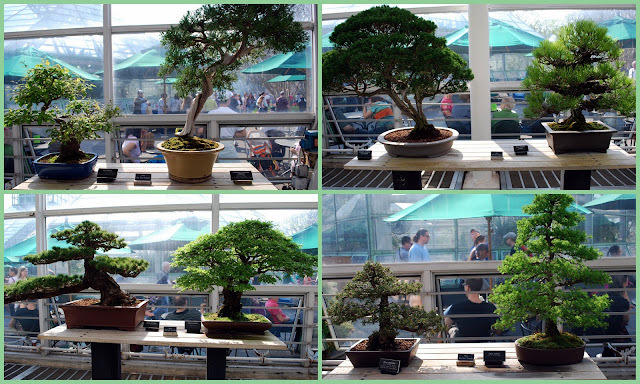 Viewing the bonsai collection was another peaceful way to enjoy nature, and since this is the centennial year of the founding of the Brooklyn Botanic Garden I hope to visit it many more times for special events this summer! I'm joining Mary at The Little Red House blog today for Mosaic Monday. Please visit her blog to see links to many blogs participating today with their photo mosaic masterpieces! Last Sunday my husband and I spent the afternoon strolling around the grounds of the 52 acre Brooklyn Botanic Garden, located at 1000 Washington Avenue in Brooklyn, New York. I have already blogged about the Japanese Hill and Pond Garden in the BBG and the beautiful Magnolia trees that were in bloom, but for Pink Saturday I thought I'd show the wonderful explosion of cherry tree blossoms that we saw in the garden that day! This is a view of Cherry Esplanade section of the Brooklyn Botanic Garden, of the trees in first bloom, taken from The Overlook. The "Prunus kanzan" cherry trees along Cherry Esplanade and the Cherry Walk were beginning to bloom last weekend, and since the temperatures were in the plesant low 70's there were many visitors enjoying the day in the garden.The esplanade is the only part of the garden where visitors can sit on the grass. The Garden's Japanese flowering cherry collection contains over 200 trees of more than 30 species and cultivars that bloom in succession during April. BBG is considered one of the best sites outside of Japan for viewing cherry blossoms. According to the Brooklyn Botanic web site: "Hanami means “flower viewing” and is the Japanese cultural tradition of viewing and cherishing each moment of the cherry blossom season. Hanami is thought to have started in Japan during the Nara period (710–794 A.D.) with the viewing of flowering apricot and plum trees. But by the Heian period, (794–1185) cherry blossoms, known as sakura, had become the celebrated spring flower." The BBG even has a Cherry Watch Blossom Status Map on their web site to inform the public of what tree is in bloom and where it is located. 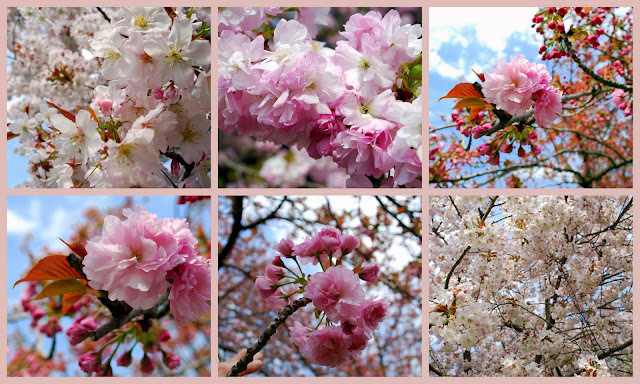 There is also a Flickr Group with many more Hanami photos. On May 1st and 2nd, 2010, there will be a "Sakura Matsuri," a phenomenal weekend celebrating Japanese culture with over 60 events and performances for both adults and children. 76 double-flowered "Prunus Kazan’ trees line the Cherry Esplanade and create a dazzling spring display. Cherry blossom time is certainly a time to celebrate Spring and the color pink! 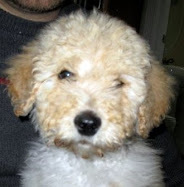 Please visit Beverly at the How Sweet The Sound blog to see links for more blogs participating in Pink Saturday today!